People who suffer from chronic stress know one thing for sure: stress is no fun if you’re trying to maintain a healthy weight. According to a report published in Cell Metabolism this year, when stress is chronic, fat cells form at a higher rate than normal. You can thank a certain type of hormone called glucocorticoids (say that five times fast), which run rampant when we’re stressed out. I know from experience, and from what my clients tell me, that gaining weight when we’re trying to keep it off is stressful in itself. Add the stress we feel from feeling overweight to our normal routine of stress from work and home, and you’ve got a recipe for disaster. But it’s OK. Just breathe. We don’t have to let stress rule our lives. Let’s take a look at how chronic stress causes weight gain so we can better understand why we need to stay relaxed. Scientists have known for a long time that stress causes people to gain weight. They just didn’t know why. Many thought that high levels of cortisol, a hormone that is released when we are stressed, increased appetite, which led to binge-eating and unhealthy dietary choices. While cortisol does affect appetite, it’s not just the stress eating that makes people who are chronically stressed gain weight. Researchers at Stanford University studied the effects of glucocorticoids. These steroid hormones, it turns out, increase the rate of development of fat cells. When levels are high, as they are when a person is chronically stressed, fat growth can increase as much as twice the normal rate. What this all means is that in order to avoid weight gain, stress levels need to go down in the evening. What Can We Do to Reduce Chronic Stress? So, what can we do to lower stress in the evening when we are winding down from the day? It depends. Whatever you can do to bring calm and relaxation into your life will work. If exercise is your thing, try an immersive activity that requires total concentration. Running or bike riding might give you a good workout, but they don’t require enough concentration to take our minds off of the stresses of work and home life. Instead, try a sport like tennis or basketball, things that make us concentrate on a goal. If you’re not into athletics, try winding down with a good book. Avoid anything that won’t captivate you. I know that when I’m stressed, I can read whole pages without remembering what I’ve read. In the end, it all comes down to what will get your attention. You need to do something that you love. Additionally, the space where you wind down should be free from distraction so that you can concentrate on lowering your stress levels. 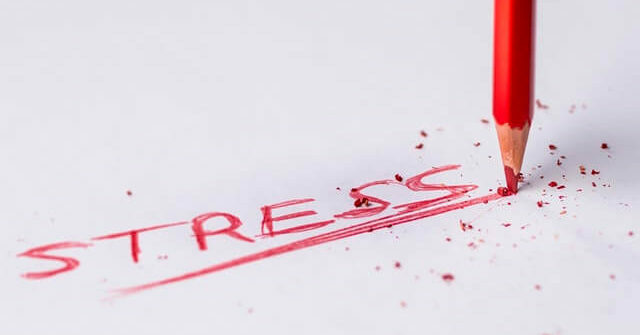 Do you suffer from chronic stress? Learn more about life coaching, and contact me if you have any questions.